Blog Outreach also known as Blogger Outreach can be a very effective method of increasing visibility for your products and services. By “reaching out” to influential bloggers willing to review or recommend your products you can reach audiences they have already built. engage groups of influential bloggers for your blogger outreach. 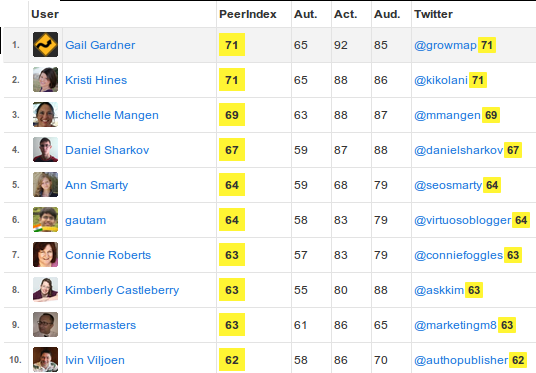 The image below shows the PeerIndex ratings of the top ten bloggers with whom we collaborate. PRODUCT IN EXCHANGE FOR REVIEW: Businesses provide products to select bloggers who agree to write a review. Bloggers are required by the FTC to disclose that they were given the product. The blogger is generally expected to write an honest review that may not be 100% positive. Honest reviews – even when they are not completely positive – are more convincing and compelling and of benefit to businesses. Be sure to choose bloggers who are highly ethical and focus on the positive. If you sell many products it can be beneficial to allow the blogger to select from a range of product choices. COMPENSATED REVIEWS: A business can offer to pay bloggers for their time. There is no set cost and the value depends on the influence of the blogger, how effectively they promote their content on social media, and how well their blog applies search engine optimization strategies so that their posts get ranked in the search engines. Common rates run from as little as $30 per post to $750 or more on a major blog. AFFILIATE PROGRAMS: Formal affiliate programs provide a method of tracking sales that originate on the blogger’s site and pay a percentage of actual sales. INFORMAL COMMISSIONS: A business could offer to pay commissions based on analytics data or information volunteered by new customers. Commissions would not necessarily need to be in the form of currency; they could be discounts towards your products or services or free items. FAN COVERAGE: Many bloggers focus on recommending what they truly believe in. If they are fans of your product or services they may write about you because they want their readers, friends and family to benefit from what you have to offer. One way to get more blogging fans is to offer them products – which brings us back to #1 above. The cost of blog outreach can vary from the time invested to identify influential bloggers who can reach your target audience to the cost of products to a set price per post or commission per sale. Costs are totally negotiable. Agencies or bloggers engaged to provide blog outreach services (identifying and arranging blog posts on your behalf) often receive a percentage of whatever per post fee is charged, typically up to 50% but sometimes more. The best way is to work with someone who already has established relationships with key bloggers who have been recognized for their influence. Businesses can also learn to use new solutions that enable them to identify influential bloggers themselves. If you choose to identify bloggers yourself, the specific tools listed below are among those frequently used to determine which bloggers have influence online and more specifically, what topics they have influence in. Engaging someone who has many followers is not useful to you if those followers are not interested in what you have to offer or the person’s influence does not extend to your niche. For example, if they are influential for fashion but you sell auto parts or gardening supplies you are unlikely to see the results you would get if you engaged someone whose audience is interested in what you sell. Additional tools to measure blog traffic, reach and influence beyond those mentioned immediately above. Selecting bloggers who have few readers or little reach across social media. Bloggers who have few or no collaborators who support their content and online activities. Choosing blogs that do not reach your target audience. If you are interested in having bloggers write about your business, products or services contact Gail at GrowMap to discuss a blog outreach program tailored to your needs. You can find out more about Gail’s background on the GrowMap LinkedIn Profile and see some of her most influential collaborators in the list in this post for Small Business Advice. To see other Services offered by GrowMap see the Hire GrowMap page and the new Small Business Internet Marketing Starter Package. This is a Great informative share of every bloggers and clients who all unaware of blog outreach services and target the way exactly! Interesting read. I believe blogger outreach is very important for all level of bloggers, be it a newbie or a famous blogger. It is one of the best link building opportunity available today. One of the side effects of BO is better relations with fellow bloggers. Yes, it is the best way freelancers and small businesses can get some visibility for themselves. I agree with Gaurav Jain , as a newbie most of people did not know about blogger outreach and no idea how to promote their blog or site. very informative tips has been added in the post as well. Most people have no idea how to do blog outreach correctly. They fill up my inbox with emails that need to be deleted because they fail to read my guidelines or worse, they have no common sense. Nice article Gail! By the way, you said that we should avoid bloggers with low reach (with which I agree) but, do you think it may be profitable to find bloggers who have a good opportunity to grow? To catch people and make relationship before they become big? A great post. I am also thinking to apply this strategy and looking for a good provider. Now after reading this tips I got clear ideas. Thank you so much for sahering. It depends on where the review is. Yes, it is illegal to pay someone to write reviews on review sites or for your own site. It is not illegal for a blogger to be paid or provided products to review provided they nofollow the links, and disclose that they were paid. Hi Gail, i was unaware of all of these mistakes of blog outreach now i will definitely keep in mind. I happy to say that your post really fantastic .I have read all post but this is so different . I will share this post with my all best business pages . I think exchange blog content can become a good tip for SEO. For some reason we don’t know how thing will happen but I can see that the algorithm will change soon and more focus on human behavior. Thank you very much for sharing these useful tools. I want to use them to make my blog.also, I read some of your other articles and those are very useful for me. Please upload your video tutorials as well. it will more help to understand me. Thanks. First of all i want to thank you for sharing such a informative and helping post. This website or plateform is great for blog owners and those who want to bring traffic to their websites. All point are right on target and very helpful. Thanks once again. Businesses can be grown with either your time or your money. Those who don’t have the money have to learn the skills and spend their time doing themselves what those with more money would pay someone else to do. Having money can help a business grow much faster. Taking on debt to grow quickly is very expensive and high risk. I do not recommend it. Slow growth is possible over time even with no money. Up until now I have spent time, and no money on ads or boosting posts or paid tools – yet I am so busy I give work to many others. This post was very helpful. I’d rather to use these tools to make our website ranks. Thanks for sharing. Helpful article. Thank you very much for sharing these useful tools. I want to use them to make my blog How to grow taller better. Thanks for sharing social media influence measuring tools, I used Technorati, Wikio Blog Ranking & Alexa Ranking ..Keep posting..Looking forward for most posts from you !! Thanks Gail for this post, I must say without blog outreach you don’t gonna get enough quality backlinks thats also why it’s so important. I am really helpful from your post.Now-a-days blogging is very important for who wants to run their websites across the world.I think when you post to the you have sincere about you same niche products and make the post very interesting too. I think blog outrech is very important for small business and also big businesses. One of the researches made by big seo company shows us that big companies which have blogs on their websites, reach their customers better. And also, for small businesses, its very important. Becouse, their customers find them from google. And posts are very good for google. Thanks for that information and article! Great article and I am searching this type of article to get more knowledge. Also this article is helpful for newly blogger and me. Huge thanks for sharing this article. I completely agree with the blog. Blogger outreach is an effective and economical method of marketing. But finding relevant and influential blogger is very important. To my sense blog outreach is very important for both bloggers and small businesses as well to generate traffic to own site. Thank you very much for this useful and helpful post. Social media measurement tools was beyond my knowledge . thanks for this all in one solution. There is no need of going to another place now. Everything is available in this post. Informative tips for Blog Outreach Services.blog is always provide a good traffic for your site.I tried to try and do things properly, are a member of an internet forum, written plenty of post, yes, I advertise and that I use affiliate promoting. I use social promoting, however I’m certain not the maximum amount as I ought to or as usually. I’m still engaged on social promoting. this is realy useful article especially for me.. i’ve been trying so many tools for the last 2-3 weeks …i wasn’t getting it ..thanx a lot for this informational post. I use Social Marketing, but I am sure not as much as I should or as often. I am still working on Social Marketing. You should look at a social media management tool. If you want to track whether your actions on social are leading to sales look at Oktopost. (See my review in the link I put in CommentLuv in this post about Social Media Management. Thank you so much great information about Search engine optimization. Blog outreach is so important if you want to rank your website and above mentioned tips are good and do follow these !! I agree and do not agree with everything here. If no one helps the person who has just started; how are they to gain any status at all. For instance, I have had gobs of unsolicited, spam traffic. I have written and written some more. I have joined blogs and tried to write great material. Yet getting sufficient, and useful traffic has been hard. Sometimes what works for some may not work for others. The reason bloggers collaborate, use CommentLuv Premium, and support each other on social media is how we help new bloggers gain status. It is much more challenging to get traffic today than it was when I started this blog 6 years ago next month. One thing that does still work is commenting on other CommentLuv blogs. Thank you Gail for your response. I was not being critical at all, it just seems that getting the right kind of traffic has been almost impossible for me. I first started writing online in latter 2009 also. Mortgage blog, and several other blogs. Wrote on HubPages, Wizzley, Infobarrel etc. I did make some money but nothing to brag about. I have also had 3 other websites. (not successful). Took those down. Did not write much at all in 2013 as I worked contract mortgage lending. Anyway, I have been back with this new website (started January); and here I am still struggling. I have tried to do things correctly, have been a member of an online forum, written a lot of post, yes, I advertise and I use affiliate marketing. Do not know why I am telling you all of this; except that it is very hard to get the traffic you need or has been for me. I am sure I need to comment more on the comment luv sites. What is your goal? Most bloggers I know who make a living are providing services: writing, installing websites, doing consulting, managing social media or acting as virtual assistants. I was just listening to this video Jon Morrow emailed and he confirms the same thing. Thanks for this awesome service, I was looking forward for something like that and I have reached here to get it. Contact me if there is anything you need. Skype is the most efficient way. My username is GrowMap. Or you can contact me through the contact tab at the top of this page. I think blog outreach is incredibly important for both bloggers and small businesses to bring traffic to your site, but also to network with likeminded people in your cause. Thanks for this very informative post. I wasn’t aware of these social media measurement tools!